Mumbles, bless his heart, has been such a loving husband — making meals and snacks, cleaning the house, taking Baxter for walks…all so I can get as much rest as possible, eat well and stay calm, happy and relaxed while our son is growing inside me (p.s. still so weird to think that I’ve got a human in me!). The other day, Mumbles devoted about 40 minutes of prep time in the kitchen to prepare a delicious meal of veggies and pork that were set to marinate overnight and cook the next day in the crock pot. We had a quick cautionary joke between the two of us about the last time he tried to make a crock pot meal and in the hustle of getting out the door for work that morning, forgot to plug in the crock pot before he left. Ahh! Such a sad, sad realization when you come home expecting your house to be filled with delicious aromas only to find unsafe, uncooked pork and veggies that have been sitting out all day lukewarm. What a waste! Well, I wish I could say the same thing didn’t happen to us again a few days ago, but I’d be lying. He did plug it in this time but he thinks perhaps when reaching for something on the counter nearby that he knocked the plug loose. Either that or our crock pot is just too old (it was a hand-me-down from his mom in all its vintage navy, orange and yellow flowery awesomeness). 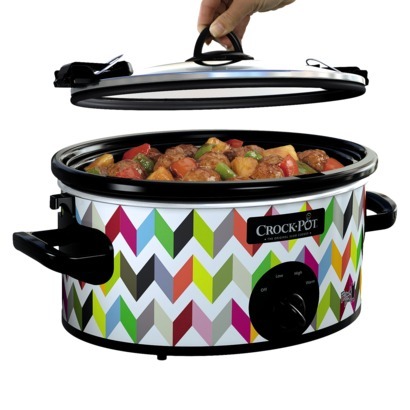 All that happened and the next day I saw Target Does It Again post this photo on Instagram of a delightful new Target collaboration with French Bull and I immediately knew I had to have the crock pot. Had to. Seeing that it wasn’t available in stores near me, I ordered it right away. I can’t wait to surprise Mumbles with it! If you’re looking to spice up your kitchen with some appliance flair, the French Bull line at Target also includes a toaster, K-cup single cup brewing system, and a blender. So fun!